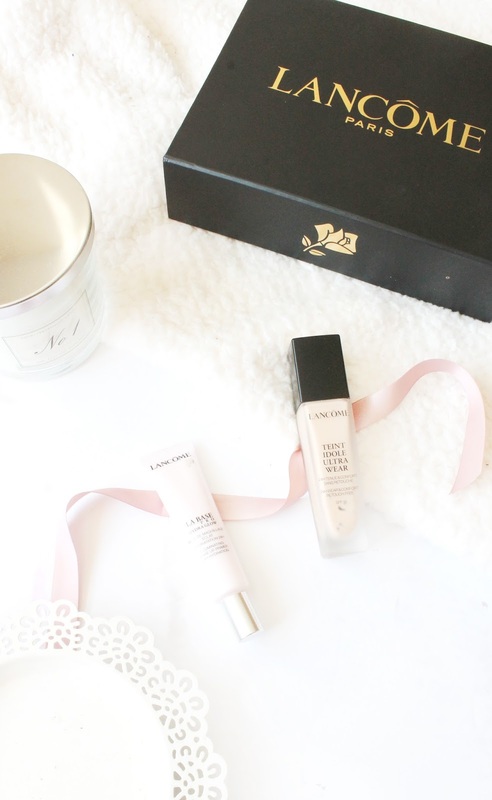 A week or so ago I shared my Spring Beauty Picks, and here I featured a foundation that i've recently been loving from Lancome and I thought that it needed an in depth review of it's own to share my thoughts on why all of you need to go out and try this! Lancome has been a brand that i've had the opportunity to try a fair few products from in the last six months or so, and it has grown to be a firm favourite of mine as their products are made to such a high quality, that it's very much noticed in how well in the products perform in my opinion. A few weeks back a very special package arrived, that I had no idea I would be receiving and all was presented in a beautiful black box, and without a doubt is the most beautifully presented PR package i've ever received. Within the box was the Tient Idole Ultra Wear Foundation* (£31.50) along with the La Base Pro Hydra Glow Primer* (£28.50), and finally their All Foundation Brush* (£29). I thought this was such a cute PR package, and is essentially designed to be the best way of perfecting your base. After loving a couple of their other base products I was excited and intrigued to see if I liked these products just as well. I've been trying out all three products for about three weeks now, and it's safe to say i've been absolutely loving these products. The La Base Pro Hydra Glow Primer* (£28.50) is probably the nicest primer that i've used, as it's great at not only priming and prepping the skin, but also hydrating and giving the skin that radiant glow that it needs in order to stop your foundation looking dull. Since using this I have found that my foundation just looks so much better, and lasts so well throughout the day as it usually dries into my skin come the end of the day, but with this it hasn't been at all. Moving onto the Tient Idole Ultra Wear Foundation* (£31.50), which is hands down my favourite high end foundation as it has firmly replaced any that I have previously love, although I am a big lover of a drugstore foundation. Luckily they sent me the perfect shade for skin tone, which is pretty surprising seeing as I am naturally quite pale. What I love about this foundation is that the coverage is absolutely amazing, hiding pretty much every blemish or uneven bit of tone but it's so light on the skin that you don't even realise you're wearing it. I also find that using this in conjunction with primer to be the perfect match base wise, as the primer just makes the foundation sit so beautifully on the skin. Finally I find applying these two products with the All Foundation Brush* (£29) to be the perfect brush to use, as it buffs the foundation in seamlessly to the skin and is also small enough to perfect on the go, or for any touch ups. I will say the brush does seem a little pricey in comparison to alternative brushes but if you like using good quality brushes to apply your foundation, then i'd definitely recommend trying this one out. Have you tried any of Lancomes base products?